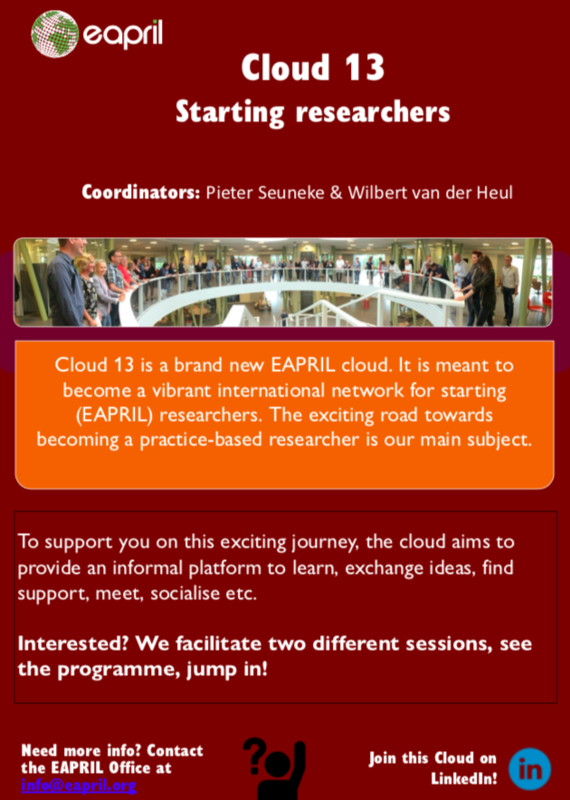 EAPRIL 2018 will host a new cloud: the ‘starting researchers’ cloud’. This cloud is meant to become a vibrant international network for starting, practice-based researchers (from all ages), in the field of (innovation in) learning (learning occurring in different contexts as well as at different levels). Whereas ‘learning’ is the main focus of most EAPRIL clouds, in this cloud it is a mere context. Instead, the bumpy road towards becoming a practice-based researcher is our main subject. On this journey, the cloud aims to provide starting practice-based EAPRIL researchers an informal platform to learn, exchange ideas, find support, meet, socialise etc. Starting practice-based researchers of all kinds: MLI-students, PhD’s, professionals in learning starting with research activities etc.